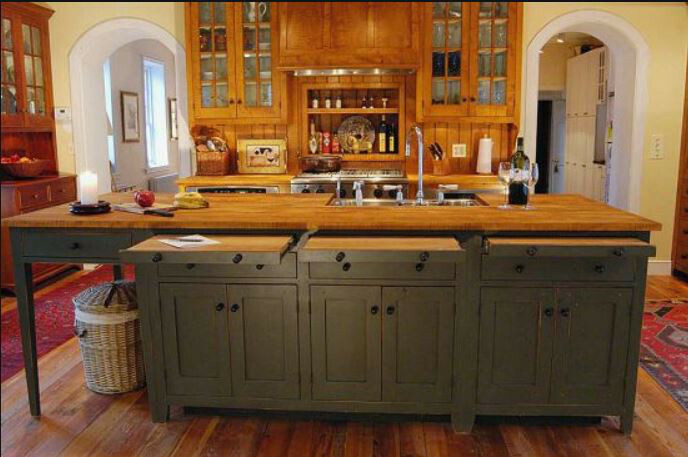 Dark gray shaker cabinets add an exquisite historic “furniture look” to an unfitted kitchen. Take a tour. For many years I’ve had the pleasure of showing this highly unique unfitted kitchen, one tastefully based on historic American Shaker furniture adapted for a modern home [top]. Now I discovered additional photos so I’m reposting this traditional beauty so it can be viewed as fully as it deserves. A kitchen like this is rarely found in the U.S., where cabinets generally are built-in around the perimeter. And while hutches are popular as stand-alone pieces it’s rare to find a cooking space with four furniture-quality dressers and armoires — each with a distinct personality. Made by the Workshops of David T. Smith, which specializes in cabinets based on traditional and antique American furniture styles, the look wouldn’t suit everyone. However, it seems perfect for a 19th century brick house in Northern Virginia where it occupies an extension built in 2003. 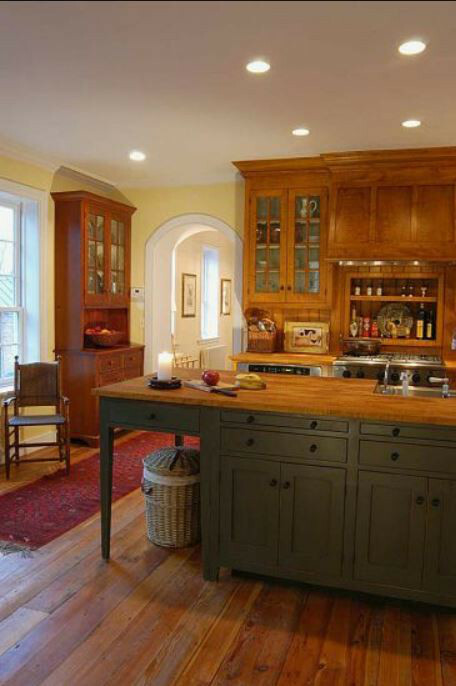 The danger with any historic kitchen look is the just that: it’s very specific and can feel out of step. However, this one is so well composed and detailed it has a timeless quality. Overall the plan is simple. 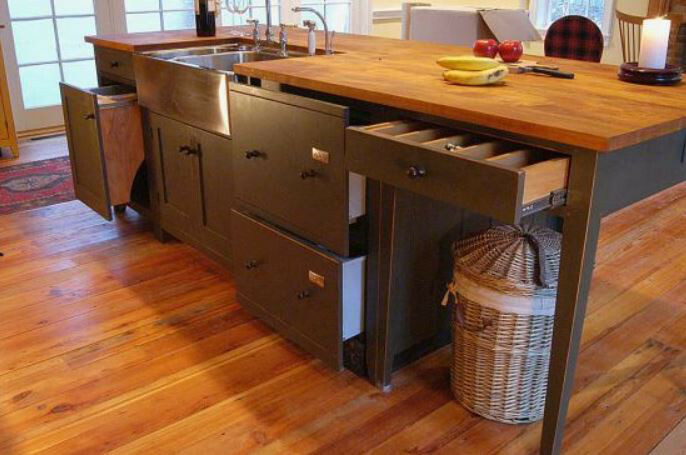 This is a galley kitchen with a sink in an island composed of dark gray shaker cabinets. The range wall, built to resemble a colossal curly maple hutch with a planked back, houses a rangetop (with storage drawers below), a spice shelf, the concealed vent hood, and two ovens installed under the counters. 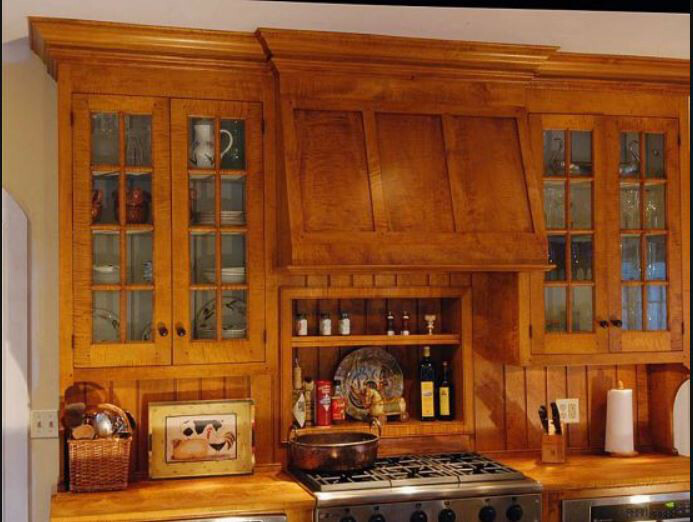 Upper cabinets on each end have reclaimed glass doors and, in the Shaker style, all the knobs are wooden. 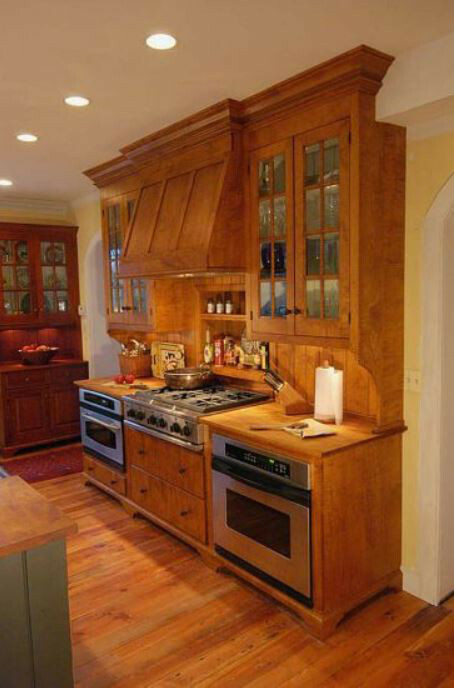 Stained and oiled curly maple counters are used throughout. The business side of the island has a stainless steel farm sink, with a Barber Wilsons faucet. To the right of the sink are Fisher & Paykel dish drawers and a place for utensils. The open end doubles as a table with graceful tapered legs. A trash bin, on the left, is conveniently in the path from sink to fridge. The finish on the dark gray Shaker cabinets looks as authentic as original milk paint the Shakers used. A few steps from the sink, just across the aisle, a SubZero refrigerator is disguised in a curly maple armoire tucked just under the beams. 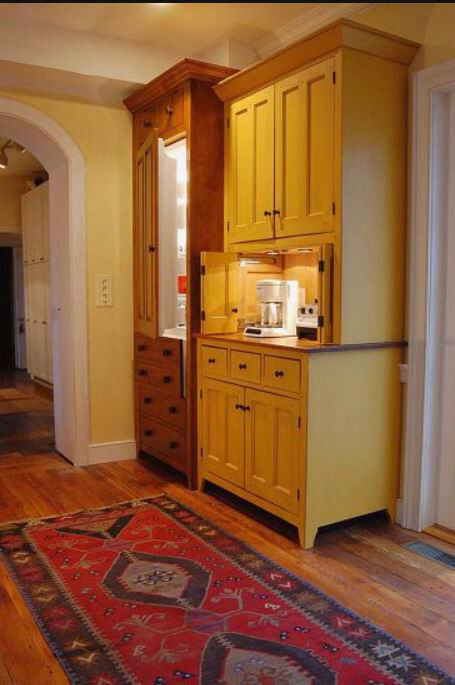 A contrasting, mustard-yellow painted chest-on-chest style cupboard (yellow was a Shaker fave) fills the remainder of the wall space provides an additional work surface and an appliance garage — in addition to other storage. 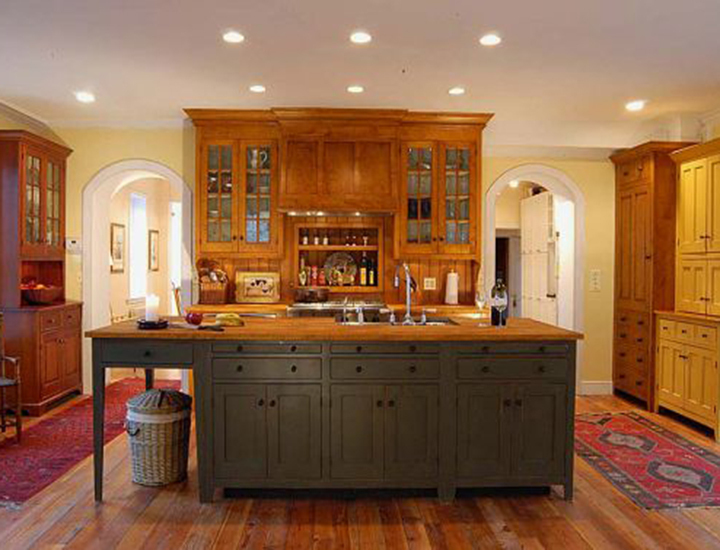 An antique pine floor and Oriental rugs heighten the elegance and warmth of the entire space. Across the kitchen on the opposite wall, a stand-alone cherry dresser is used for display. The dove gray color on the island is one of those unforgettable hues – neutral yet nuanced and it works perfectly with the reddish wood tones and yellow accents. In addition to cabinet storage and black, contrast-painted knobs, there are three bread-board style pull-outs. While these could certainly be used for serving, or for additional work space, at least for a time they do triple duty as homework desks for the owner’s three children. The Shakers, who prized simplicity and utility in their furniture, would certainly approve. This is my favorite David T Smith kitchen. I discovered the workshop after we built, or else I would have contacted – definitely next house. For now, I absolutely adore the pottery pieces I’ve collected the last 7 years. My favorite is the paper towel jar on our island. Havent seen as many of these as I’d like and would, of course, love to see one in person. So if you get one, I’ll come visit LOL! I really like how they “wrapped” the top/molding over the soffit–different, and effective. Adds detail and character at the top of the “hutch” while preserving full depth cabinetry and storage. Do we know the brand or color name of the paint on the dove gray island? This is a David T. Smith kitchen. They do custom finishes so it isn’t a question of a paint color. I’ll add a link to their website so you can see for yourself. A color like lamp room gray, or downpipe from Farrow & Ball would be similar to the color in this kitchen. Alternately, I’m sure that Benjamin Moore has any number of similar colors.